Spotify now lets you download a whole lot more music for offline listening -- 6,667 more tracks, to be precise. The Swedish music streaming giant now allows Premium subscribers to download 10,000 songs per device on up to five devices, a considerable jump from its previous limit of 3,333 tracks onto three devices. "At Spotify, we're always working on improving the experience for our users," a company spokesperson said in an emailed statement. "We can now confirm that we have increased the number of offline tracks per device -- from 3,333 on 3 devices to 10,000 tracks per device for up to 5 devices." That means the total limit is now 50,000 songs, meaning you can have plenty of tunes should you take a long trip into the wilderness or otherwise choose to unplug. It's still less than Apple Music, which allows you to store up to 100,000 songs, and Amazon's Prime Music allows you download as many songs as you like onto four different devices. It's more customizable than Pandora Plus, which downloads up to four of your most-listened-to stations for your Offline Station list. Spotify Premium costs $10 a month. In August, the company bumped up its offerings for US college students, adding a subscription to Showtime to its $4.99 per month Spotify Premium for Students plan . New Yorkers will have gotten used to seeing Apple Music and Spotify billboards appearing in the iconic Times Square, promoting fresh music from key artists. In recent months, for example, Spotify has paid for huge New Music Friday banners promoting tracks from the likes of Liam Payne & J Balvin and Ariana Grande. Apple, meanwhile, has backed the likes of Nicki Minaj and Torey Lanez with very similar real estate in the same location. A couple of weeks ago, however, those in Times Square might have had to do a double take: because the same artist was promoted by both global streaming giants in the location. An Streambeet blog reader in NYC snapped the shots and just sent them into us; interesting, right? Step forward, British singer/songwriter Nina Nesbitt (pictured) – who is currently benefiting from a simultaneous worldwide push from Spotify and Apple. Nesbitt has released two new singles this year, Somebody Special and latest track Loyal To Me, in addition to other songs like Best You Had. Loyal To Me was recently re-recorded for an exclusive ‘Spotify Singles’ release which arrived late last month. It’s not the first time Nesbitt has recorded an original for Spotify’s service: in March, she issued new track Psychopath, recorded with Sasha Sloan and Charlotte Lawrence, as a Spotify Singles release to celebrate Women’s History Month. It was accompanied by a cover version of Cyndi Lauper’s Girls Just Wanna Have Fun. Nesbitt was formerly signed to Universal/Island Records for her 2014 debut album, but now releases music independently, licensed through UK-based independent Cooking Vinyl worldwide. Cooking Vinyl founder Martin Goldschmidt told MBW that Nesbitt has now clocked up 100m streams on all formats, and is currently pulling in more than a million streams each week. But what’s drawn such mutual, simultaneous support from Apple and Spotify? Especially in the same quarter that Nicki Minaj is claiming that support from one (Apple) led to promotional punishment by another (Spotify – something the green machine outright denies)? “All the DSPs believe in Nina and love her music – it’s really that simple,” says Goldschmidt. For decades, the path to stardom in the music industry has usually gone through a major record company. Almost every artist today who reaches the top of the charts — whether Kanye or Adele, Beyoncé or Drake — has gotten there with help from one of the three conglomerates that control around 80 percent of the business: Universal, Sony and Warner. Now Spotify is experimenting with another approach, one that is making those labels nervous. Spotify, a Stockholm company that went public in April, has offered few details about its entry into the talent marketplace. It has not revealed which artists it has made deals with, and declined to comment for this article. According to six people in the music industry who have been briefed on the recent deals, but were not authorized to discuss them publicly, Spotify has paid advances to management firms and other companies that represent artists who are not signed to a record label. For now, that means up-and-coming acts and older artists who have gained control over their vintage hits. Spotify is offering artists two advantages: a bigger financial cut and ownership of their recordings. The deals, furthermore, are not exclusive, leaving the artists free to license their songs to other streaming companies, like Apple Music and Amazon. Spotify typically pays a record label around 52 percent of the revenue generated by each stream, or play, of a given song. The label, in turn, pays the artist a royalty of anywhere from 15 percent to, in some cases, 50 percent of its cut. By agreeing to a direct licensing deal with Spotify, artists and their representatives are able to keep the whole payout. The closest the company has come to making its ambitions public was during an earnings call in July, when Daniel Ek, the company’s chief executive, confirmed reports in Billboard and elsewhere that Spotify was pursuing direct deals with independent artists. He was careful to add that such deals did not mean Spotify was turning into a record company — something that Spotify’s contracts with the big labels forbid, according to people briefed on the terms of those contracts. The next Ed Sheeran or Ariana Grande may be attracted by the very thing Ek cited in arguing that Spotify is not becoming a label. With its 83 million subscribers — and nearly 100 million more who listen free — the service can offer significant exposure to artists without asking them to give up something that traditional record companies demand as part of any deal: ownership of their recordings. Taylor Swift is one artist who is intent on keeping her work. She will become a free agent this year after the expiration of her deal with Big Machine, an independent label in Nashville that is distributed by Universal, and she is said to be seeking a deal that would give her ownership of her recordings. Spotify’s decision to forge closer relationships with artists comes with a big risk, however. In the end, it may not be worth antagonizing the labels that the company depends on, said Amy Yong, a media analyst at Macquarie. In preparation for its public stock listing, Spotify hinted that it had big plans to change the “old model” of the music business, which it said relied on “gatekeepers” like record companies and radio. In their place, Spotify said, it wanted to usher in a new era that would help new artists break through more easily. That stance has put Spotify in an awkward position between investors, who are rooting for disruptions that could lead to profits, and music business executives, who would like the streaming service to stay in its lane. According to public filings, Spotify had about $4.9 billion in revenue last year but almost $1.5 billion in net losses. Its stock price has risen steadily since April, and the company is valued at roughly $34 billion. Below the level of the giant conglomerates, the attitude toward Spotify’s moves has been anything but hostile. Its entry into the talent marketplace may give artists more leverage, said Zack Gershen, an executive at Mtheory, a company that consults with artist managers. Royalties and distribution costs gobble up nearly 80% of Spotify Technology's (NYSE:SPOT)revenue, which doesn't leave a whole lot left over to cover other operating expenses. The company has disruptive potential in cutting out record labels to some degree, which could improve its cost structure while incrementally transforming the industry's economics. To be clear, the major record labels will always have their place in the value chain, providing a plethora of services to develop artists, but there does seem to be an opportunity for smaller, independent artists to connect directly with listeners via Spotify. Even primary rival Apple is getting into music publishing. Spotify has another idea up its sleeve. Billboard reports that Spotify has approached numerous smaller artists and managers seeking direct licensing deals. The Swedish company is offering advance fees as well as a 50% cut of revenue per stream. The outlet estimates that most major record labels in the U.S. generally take in about 54% of revenue per stream, but only 20% to 50% of that makes its way down to the artists and managers. For these proposed arrangements, Spotify would effectively be cutting out the record labels and getting direct licenses for the content. That would leave a lot more to go around for both Spotify and artists: Spotify would pay out less than it would normally have to, while artists would earn more as well. Importantly, Spotify is structuring these offers in a very clever way. Billboard points out that Spotify is not trying to become a record label for itself, which encompasses much, much more. The offers apply exclusively to Spotify's streaming platform, leaving the artists free to ink other deals with other platforms. The music-streaming company would not be looking to own the copyrights, a core aspect of how labels operate. Additionally, Spotify would not be trying to get a cut of revenue generated from outside its platform; traditional labels and distributors get a cut of all revenue generated across all platforms and services. That would allow artists to retain significant flexibility beyond Spotify. It's worth noting that Spotify's existing licensing agreements with record labels preclude it from directly competing with them, but Spotify appears to be managing this risk with the unique structure of the offers, as well as the fact that it's currently going after less prominent artists. Spotify renegotiated its licensing agreements last year, which has dramatically reduced its royalty burden and allowed for gross margin expansion. For example, cost of revenue in the first quarter was 75% of sales, down from 88% a year ago. The company pays varying royalties that are affected by a number of factors, such as whether the user is a premium subscriber or ad-supported, what country the user is located in, and whether the user is part of a family or student plan, among others. Some of the agreements even require Spotify to hit certain targets with its user base, such as the ratio of free users to paid users or subscriber churn. Direct-licensing agreements that are catered to the platform have the potential to incrementally reduce Spotify's costs, and considering how much time, money, and effort goes into inking and complying with licensing agreements with record labels, every little bit helps. If you have a Spotify for Artists account, you know that you can customize your header photo, edit your artist bio, post concert dates, pin your favorite music or playlist to the top of your profile, and more. Well now you have two more ways to strut your stuff on Spotify. The ABOUT tab on your profile will now display off-platform links, so listeners that want to check out more from you can follow you in other places besides Spotify. Are you having a tough time finding followers and fans on Spotify? Gaining followers on Spotify can be tough! You have no idea where followers are coming from- social media, word of mouth, Google. Don't worry, in this post we will give you some solid hacks and show you exactly how to get free Spotify followers. It's your job to turn them into fans and get them talking about your music. People love to support a mission or a goal. Take for example services like Kickstarter, people sign on because they want to support someone doing something cool. For example instead of shouting across the internet "follow me on Spotify" tell a story or give a reason why. "I am trying to get to 1,000 followers by September and get booked for EDC Las Vegas. Follow me on Spotify to support my mission!" That is going to get you ten times the amount of engagement than people just following for no reason. You can also highlight your music in your post. Example: "I'm a classically trained guitarist, my music is great for reading and deep focus. Give me a follow on Spotify and let me know what you think!" The best way to test this is to post to different groups on Reddit. Submit your pitch and make sure your title is something intriguing like "I need your help" or "Help make an artist's day." Use the feedback you get from Reddit to change and improve your pitch. If you have 1,000 Facebook friends there is a good chance 300-600 of them are on Spotify. Draft up a message that you can send out to your Facebook friends. Be detailed and don't forget to tell them why they should follow you. Being your friend is hopefully enough but give them your pitch just to be sure. Writing a post simply is not enough you need to message each person individually. If you are bold have them send you a screenshot of them following you. Make sure all of your social channels have a link to your Spotify in your profile with a call to action! This makes it easy for people you connect with on social media to follow you and become instant fans. Most email services are free up to a certain amount of contacts. Odds are you have a network of friends and contacts you have emailed that you haven't even tapped into! Setup an email blast on mail chimp and ask for a follow. Use your same pitch from step one in the body of your email. Here is how to setup your email blast. Step 1. Export your contacts from Gmail. Step 2. Setup a free Mailchimp account for your email blast. Import your list to Mailchimp that your exported from Gmail. As they say nothing in this world is free and you do have to work to setup these different ways of gaining free followers. The more you put in these strategies and tip the better chance you have at gaining Spotify followers for free. Once you get them all setup they are mostly automated, sit back and watch the Spotify followers roll in. The campaign for creators, musicians and their teams distills insights from the past year into custom micro-sites. Spotify unveiled its "2017 Wrapped" for creators campaign on Wednesday (Dec. 13), offering year-end insights to artists with custom micro-sites celebrating their successes on the music streaming service. The campaign is the latest in Spotify's "2017 Wrapped" initiative that rolled out a consumer-facing option last week, chronicling users' listening habits from the past year. The artist offering delivers similar results, but for their own music. Musicians and their teams can access and share their "2017" wrapped pages via the dashboard in their Spotify for Artists accounts. Among the data points included are the biggest days of the year for up to three of their tracks, total unique listeners, total number of times their songs have been streamed and the total duration of time spent listening to their music. "The key for us was to acknowledge each artist and the amazing year that they've had ... and also create a shared place," Spotify's vice president of product Charlie Hellman tells Billboard. "So these sites are things that the artists can share out with their fans, and it's a space that's cool and fun for the artist but also the fans to check out and go through together and have a conversation around. "As we did it, we wanted to bring these numerical achievements to life in a really human way, so when we talk about the total amount of people that listen to you, we actually frame that in terms of a venue size. So if you're a super star artist we tell you you could fill Wembley Stadium 100 nights in a row with your fanbase, but for a smaller artist it might be like you could sell the Mercury Lounge two nights in a row." Among the other offerings are insights into new listeners reached from appearances on Spotify's Discover Weekly and Release Radar playlists and the three countries that most of their listeners live in, along with how to say hello in their languages. "The whole purpose of Spotify for Artists is to try to separate the signal from the noise and distill down the key insights for artists," he continues. "And this is just doing it on a different time scale where you can not only see what's happening to you this week and see how your fans are trending and what playlists you're getting added to, but you can see over the course of the whole year how are fans listening to your music and what your big days were and how you were being discovered." All artists with music on Spotify and at least three listeners before Nov. 1 can access their "2017 Wrapped" data by creating or logging into their Spotify for Artists account here. The images in this article have been supplied courtesy of country singer Dustin Lynch. The playlist is the most powerful medium in music. Streaming music companies spend millions developing algorithms and hiring teams of curators to create them, millions of people tap play on them each day, and some — like Spotify’s Discover Weekly — give you a reason check your phone every Monday morning for a new collection of songs exclusively tailored to your tastes. Even Drake tried to get in on the hype by dubbing his last album a playlist. At the top of the playlist game is Spotify, which has become a kingmaker with hand-curated playlists such as RapCaviar and Rock This, helping it build out what it deems is the clearest representation of the sonic landscape. Sometimes these playlists shape pop culture, helping to determine what ends up at the top of the Billboard Hot 100, and sometimes they simply reflect it, but with multiple playlists each boasting over 6 million subscribers — a bigger audience than every paid on-demand music service except for Deezer and Apple Music — there’s no disputing that the world’s most popular paid music streaming service has an outsized influence on popular music in 2017. Now Spotify is in the midsts of redefining the playlist. After months of public testing, Spotify re-launched RapCaviar in August with a new artwork-heavy design, and for the first time it brought videos to the playlist. It’s also given the playlist its own production staff and distinct branding, essentially treating it as its own sub-brand. With editorial content, vertical music videos, a six-city concert tour, and over eight million subscribers, RapCaviar has proven that the playlist can be far more than just a collection of songs updated once a week. Viva Latino will launch this week with a new design and new exclusive vertical music videos each day this week from some of the biggest Latin music stars in the world, including, J Balvin, Annita, Luis Fonsi, Daddy Yankee, and Bad Bunny. 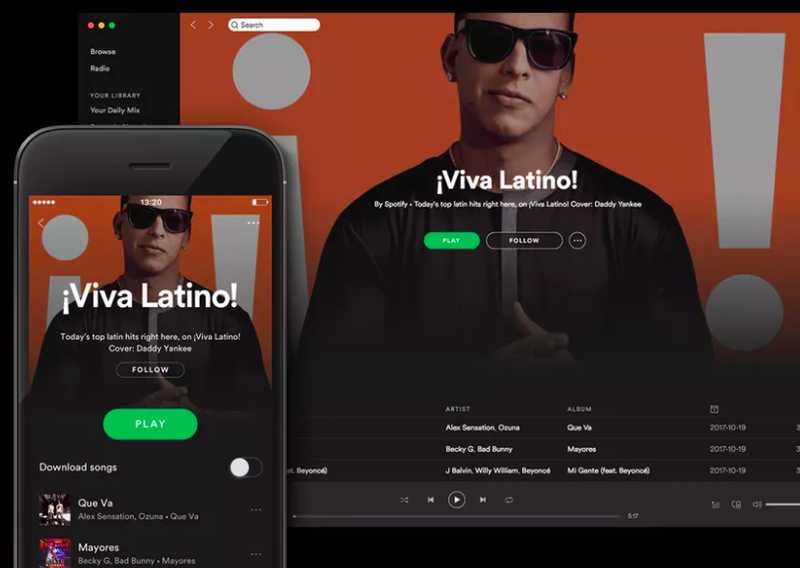 With a new video production and programming team, new branding, and plans to highlight a different artist with video on a weekly basis, Spotify is attempting to grow Viva Latino into the premier spot not only for Latin music but for video content as well.